The annual carols around the tree event held on Monday 18th December 2017 was a great success. The Lord Mayor Barbara Boyce and the Lady Mayoress Valerie Clark attended together with the children from Wonder Years and the Sing Stars from Wigginton Primary School and around 100 residents. Refreshments were kindly provided by Sainsbury’s Haxby Store. The Annual Carols around the tree event will be held on Monday 17th December at outside the Old School, Mill Lane, commencing at 6-45pm for 7pm followed by refreshments. 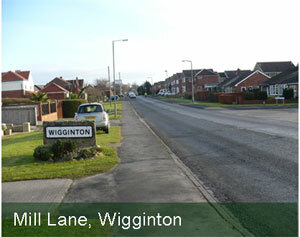 Wigginton lies 5 miles north of the centre of the historic city of York. The village has no obvious visual boundaries to the east and north and is defined by a system of drains that run along the edge of Wigginton Moor. To the south the furthest most point is bounded by the York ring road and the western boundary with Haxby runs down from Broad Oak Farm down to Moor Lane, Westfield Lane, Kirkcroft to Green Dike Lane and then to the ring road. Wigginton has a Primary School, a Health Centre, a dental practice, 2 churches, 2 public houses and a village shop. Public facilities include a church hall, village recreation hall, the old school and the Wigginton Sports and playing field Association which offers the opportunity to play squash, tennis, bowls, pentane, football and triathlon. There is also a safe play area, Church Fields, for younger children and to the west of the village newly planted woodland, millennium wood. The town sits on flat ground consisting mostly of clay with soil that is sand and alluvium. In the centre of the village is Westfield Beck. The nearby town of Haxby now merges with Wigginton though the old Parish Boundary map still shows the dividing line. This runs east to west along the back of the houses on Wheatfield Drive on its southern edge as far as Barley Drive. Here it turns northward cutting across Greenshaw Drive until it reaches the road known as The Village. The boundary follows this road until it turns west. The boundary at this point continues northward cutting across Windsor Drive near Ripley Grove and then out into the countryside. A free advice service is available to all Wigginton and Haxby residents at the above venue which runs from 9:30 – 12:30 on the first, second and third Wednesday of each month. Advice and information can be obtained on a wide range of issues including Benefits, Debt, Employment, Housing, Family & Personal, Immigration and Consumer problems. With all of life’s worries and complexities, a situation can quickly get out of hand and a way forward can seem impossible. Getting impartial and confidential advice allows an informed decision to be arrived at and a solution found at no financial cost to the client. This is a drop-in service with no appointment necessary. The Haxby and Wigginton draft neighbourhood Plan is now available for comment, we do encourage residents to read this important document and let their views be known as this represents our opportunity to influence future developments in Haxby and Wigginton.